Children's books are always a favorite in our home. It was not too long ago I was reading these to my kids. My son still likes to read and review them because he has a good eye for illustrations and childhood rhymes. Here is a description of the book followed by our review. 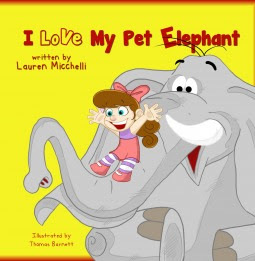 I Love My Pet Elephant is an adorable book that is fun and sweet. The text is in rhyme, easy to read and conveys so much in a few words. We are not given the name of the little girl but she speaks in the first person so that children will be able to relate. Her love for her pet elephant named Pete comes through in how they play with each other. They are a duo that do everything together, different activities during the different seasons, like sledding in the winter and swimming in the pool in the summer. The illustrations are colorful and joyous. My favorite is the one with the little girl flying on Pete as he flaps his giant ears. For my son, it's the first illustration that shows the little girl sitting on Pete's trunk as she hugs him and they look at each other with affection. So sweet! This is a simple story about friendship. The fact that Pete is big and not the usual kind of pet makes it interesting, since his size can be useful in some cases and cumbersome in others but this does not deter the little girl from loving him. She loves him just the way he is. A delightful tale suited for young children that makes good use of the imagination and rhyming text. To read more reviews, please visit Lauren Micchelli's page on iRead Book Tours. Yes, I'm sure she would! It's a delightful book.